Today we want to focus on pencil skirts again and ways how you can create adorable and stylish outfits with them for a spring. 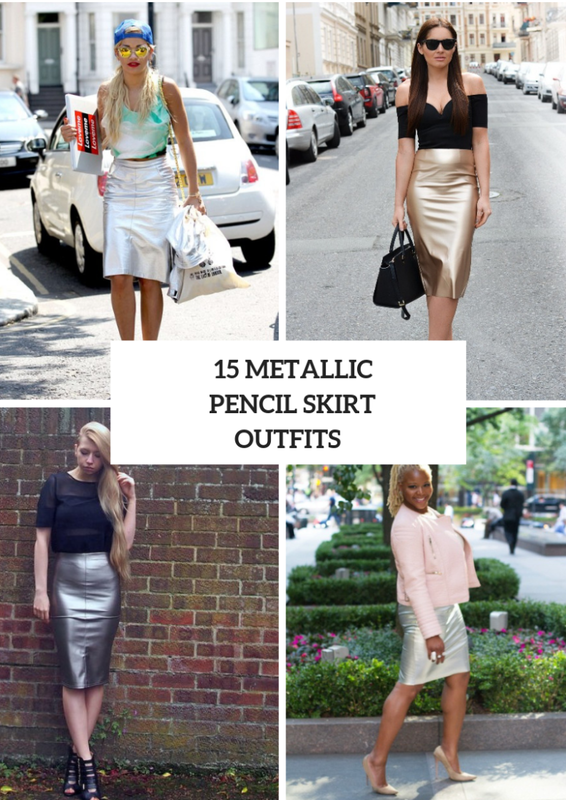 It isn’t a secret that metallic pieces of clothes, accessories and shoes are still trendy, and I want to share with you some examples how you can combine metallic pencil skirts with other items. You should know that fashionistas mostly choose golden or silver ones, but you can find more eye-catching emerald, red or any other bright colored skirts. Now you can look below to consider all ideas that we have collected just for you. Enjoy! If you want something fashionable for every day, then try to repeat a Rita Ora’s look. So you can take a white and mint green sleeveless top and pair it with a silver knee-length pencil skirt, a blue cap, sunglasses, silver pumps and a chain strap bag. Or you can choose a black shirt and combine it with a metallic skirt and black cutout shoes. If you wanna make an elegant outfit for an event, then you can mix a black off the shoulder fitted top with sunglasses, a golden high-waisted midi pencil skirt, a black leather bag and black pumps. Or change a top to a white button down shirt and a classic bag to a clutch. If you love a sporty chic style, then you can combine a silver knee-length pencil skirt with a black and white bomber jacket, a mini clutch and black high heels. Don’t be afraid to mix two metallic pieces of clothes in one outfit, for example, you can take a black turtleneck and pair it with a silver metallic blazer, a silver high-waisted skirt, rounded sunglasses and a black leather clutch.